2018 GeOnG Registration Now Open! CartONG is changing the format of its GeOnG newsletter, and uses this update to also comply with GDPR - more information at the end of this newsletter. If this email is not displayed correctly, you can consult the newsletter on our website. To read it in French, please click on the flag above. Enjoy the reading! 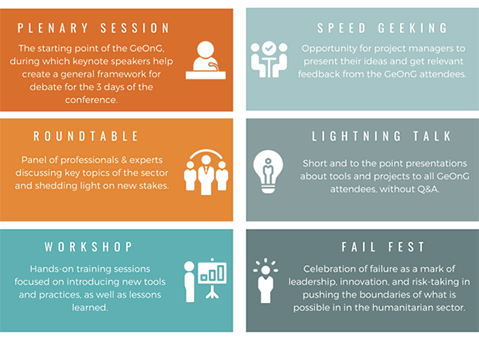 Registration for the 2018 GeOnG Forum is now open! You can already buy your ticket for the next GeOnG on our website. For this edition, we offer 2 different kinds of tickets : a standard and a reduced 3-day conference pass, depending on the participants’ profiles. Please note that tickets include all coffee breaks and lunches, as well as 2 dinners. Standard rate applies to participants from the NGO, International Organization & academic sectors. Individual consultants working with NGOs and International Organizations are included in this category. Reduced rate applies to students and job seekers. Speakers can also register for free to the event. They may choose to give a voluntary contribution if they wish to do so, which will help CartONG cover the logistical costs of their participation. We welcome the participation of private organizations. If you wish to join us, please get in touch with Nina & Mathilde. As usual, CartONG volunteers helping with the organization of the event can register for free. By signing up to the GeOnG, participants agree to abide by the code of conduct. Last edition, more than 140 participants from 70 organizations took part in the GeOnG Forum. We hope to see at least as many of you this year! Want to know more about the type of organizations who attend the event? Need help with planning your trip to Chambery? We are currently working very hard on designing the best agenda possible for this year's event, and we would like to take this opportunity to thank all the humanitarian and development actors, technical experts, and researchers who have already agreed to join us and speak during the event. We're very happy to announce that Laura Walker McDonald, Director of innovation at GAHI - The Global Alliance for Humanitarian Innovation, will join us to the event as keynote speaker to discuss the challenges associated with "Scaling up humanitarian tools". Take a peek at this year’s edition by watching our teaser! During the three days of the conference, participants will have the opportunity to take part in different formats of sessions which put emphasis on encouraging innovation, exchange and learning. Management experiences from the latest emergency (Bangladesh). Evaluations of Information Management projects. Information Management strategies in consortiums: pitfalls & successes. What is, could and should be the place of donors in information management policies and practices? The finalized version of the agenda will be published in the weeks leading to the conference. We will then ask participants to register to the roundtables and workshops they wish to attend in order to help us better plan those sessions and improve your experience as a participant. Stay tuned for more information! We are delighted to welcome Esri - our historical GeOnG partner - once again for the 2018 edition of the GeOnG. Esri has supported the GeOnG since the first edition in 2008. We are very thankful for their support and for bringing their expertise and solutions to the conference. ESRI ® applies The Science of Where to unlock data’s full potential in every organization. We continue to pioneer real-world problem solving using geographic information systems (GIS). Our mapping and analytics connect everyone, everywhere through a common visual language that inspires positive change in industry and society. Using this powerful platform to reveal deeper insights in their data, Esri users are creating the maps that run the world. After the 2014 edition of GeOnG, we are delighted to welcome Novel-T again as a partner in 2018 and for bringing their state-of-the-art expertise in IT and experience in innovating for the humanitarian sector to the conference. Gnucoop Soc. Coop. is an Italian IT company specialized in software, web, mobile and application development, database and systems administration. We believe that free software provides economic and technical advantages, focusing on its implementation in developing countries and vulnerable contexts. Our team is composed of software engineers and experts software analysis and development. Gnucoop's expertise, passion, skills and dedication to its customers help to create highly customized platforms, matching the latest technology with the best user experience. We are very thankful to the Ville de Chambery for welcoming us at the Congress Center Le Manège, and for their support of the GeOnG Forum. ​Chambéry is a small city with a bit more than 100,000 inhabitants, situated between the Bauges massif and the Chartreuse mountain range in the French Alpes. And a big thank you to our silver sponsors: Mapbox and RSM. We thank them for their support! 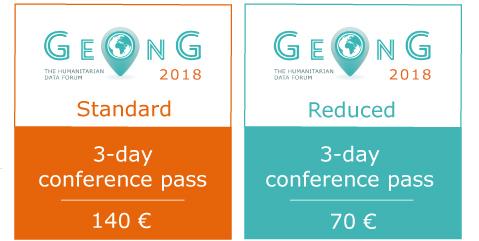 If you wish to become a sponsor of the GeOnG, you can find all the relevant information in our sponsorship brochure, or either contact Nina & Mathilde. SUPPORT THE 2018 GEONG FORUM! You know people who might be interested in the next GeOnG? Feel free to forward this email so they can then subscribe to our GeOnG Newsletter! If you wish to get involved in CartONG's associative life and volunteer during the 2018 GeOnG Forum, please do not hesitate to contact Claire. The European Union’s new General Data Protection Regulation (GDPR) went into effect on May 25, 2018. We are excited about this development because we believe it will help protect users’ rights to privacy and transparency. It is also an area of interest for CartONG and we hope that it can lead to new ways to work and to conduct project within our organization. This is the first GeOnG newsletter that we've sent since the enforcement of this new regulation and we therefore would like to use this occasion to reassure you about the use of the information that you provided when signing up for our newsletter. Your personal data is only being used for us to get in touch with you in order to provide news and updates about the GeOnG Forum. Should you wish to opt-out, you can unsubscribe using the link at the bottom of this and each newsletter. Thank you for reading!